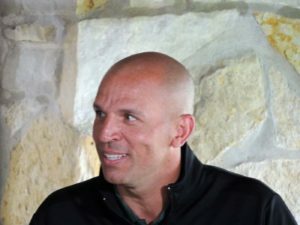 Jason Kidd and Ray Allen, two people with Milwaukee Bucks ties, are headed for the Basketball Hall of Fame. 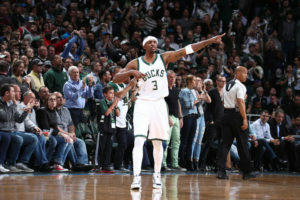 Allen is a 10-time all-star and spent his first six-plus seasons with the Bucks and goes down as one of the best three-point shooters in NBA history. 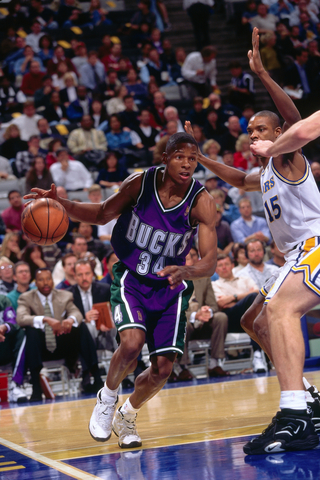 Kidd also had a great career as a point guard and most recently coached the Milwaukee Bucks before being fired during this current season. Kidd and Allen are joined by Maurice Cheeks, Tina Thompson, coach Lefty Driesell, Charlie Scott, longtime executive Rick Welts, NBA executive Rod Thorn, Katie Smith, the late Ora Mae Washington and Croatian star Dino Radja. The 2018 class was unveiled before the Final Four semifinals in San Antonio. 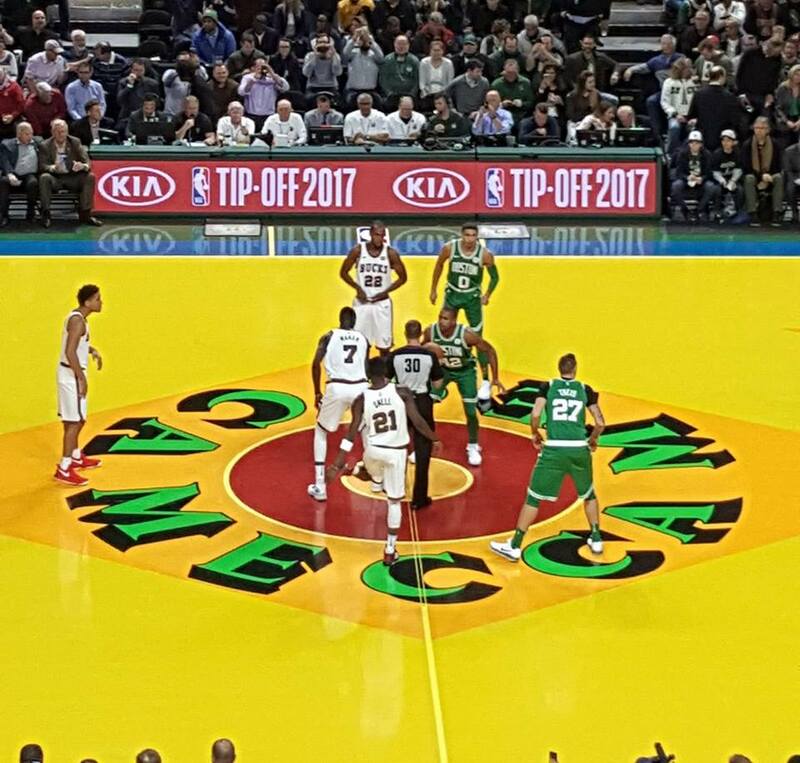 Milwaukee Bucks coach Jason Kidd took some shots at his team for their selfish play in the fourth quarter on Wednesday night. 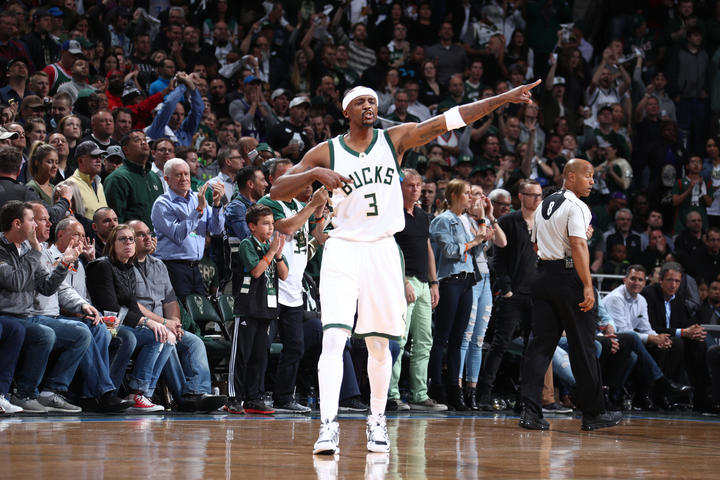 The Bucks fell to the Miami Heat 106-101 at the BMO Harris Bradley Center. For three-quarters, the Bucks moved and shared the ball. Then when the fourth quarter arrived, the players reverted back to their bad habits of trying to do it on their own, instead of playing as a team. The Bucks lost to the Heat for the second time in less than a week and fell to 23-21 on the season. “I think when you become 25 or in the 28 range you tend to think about the game,” Kidd said. “We’re talking about kids. They’re thinking about putting the ball in the basket and they all believe they can do it and until we can think about being a team and making a play and being unselfish — good things happen, we’ve seen it. “When we’re selfish we’re as bad as anybody in the league, and that’s what happens. Khris Middleton had 25 points to lead the Bucks in the loss. Hassan Whiteside had 27 points and 13 rebounds in the Miami win. The Orlando Magic dropped their 6th straight, 110-103 to the Milwaukee Bucks at the BMO Harris Bradley Center. Giannis Antetokounmpo poured in 26 points and Khris Middleton added 22 to lead the way. But all five Bucks starters scored in double figures. Eric Bledsoe had 15 points, while John Henson and Malcolm Brogdon had 14 each. Henson also pulled down 10 rebounds and blocked two shots in the win. The Bucks did struggle from beyond the arc, hitting just 4 of 19 from three (21.1%). 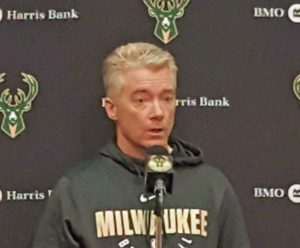 That will need to improve if the Bucks are going to knock off their next opponent, the Golden State Warriors on Friday night at the Bradley Center. The Bucks improved to 22-18 with the win. The Magic fell to 12-30. 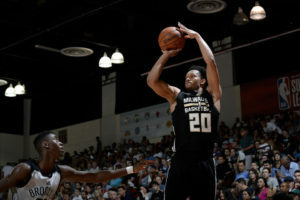 Bucks coach Jason Kidd said forward Jabari Parker is doing great and could return to the lineup in another month, before the NBA all-star break. Parker underwent ACL surgery on Feb. 14, 2017. 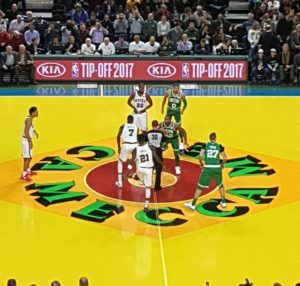 The Boston Celtics had their way against the Milwaukee Bucks in the 70’s and 80’s and the process repeated itself again last night in the “Return to the Mecca” game at UW-Milwaukee Panther Arena. The Bucks couldn’t stop the 3-ball as Celtics Center Al Horford poured in 27 points for the Celtics. Horford went 11 of 14 from the field and 4 of 5 from three-point range. He also helped hold Bucks star Giannis Antetokounmpo in check for much of the night. Giannis led all scorers with 28 points, but six of them came from three-point range in garbage time. Horford and the Celtics made Antetokounmpo work for everything he got, specially inside. 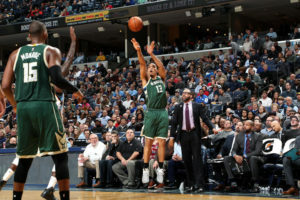 Khris Middleton and Malcolm Brogdon added 15 points each and Tony Snell had 11 for the Bucks, who wrapped up a 4-game homestand with a 2-2 record. They’re now 3-2 on the season. Kyrie Irving added 24 points for the Celtics, who avenged a loss to the Bucks in the season opener, 108-100 in Boston. The Bucks have a couple of days off before heading to Atlanta to face the Hawks on Sunday afternoon (2:30 p.m.). 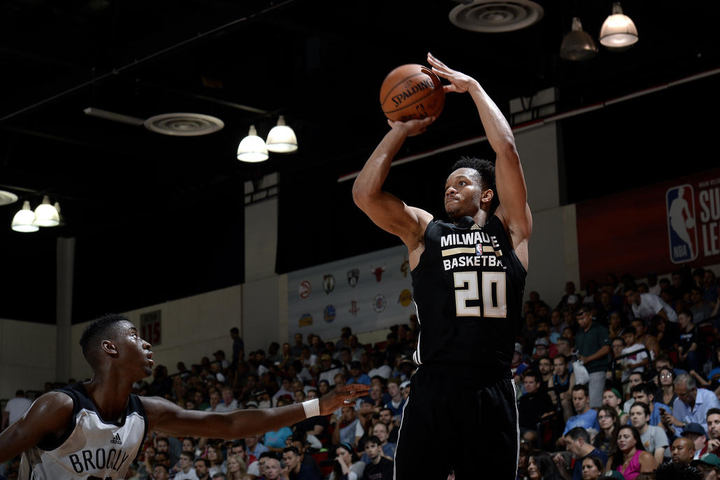 Norman Powell poured in 25 points to lead the Toronto Raptors to a game 5, 118-93 win over the Milwaukee Bucks in the NBA’s Eastern Conference playoffs on Monday night. The Raptors took a 3-2 series lead with game 6 back in Milwaukee on Thursday night. It’s a must win for the Bucks. Powell hit all four of his three pointers, leading six Raptors in double figures. Serge Ibaka added 19 points and DeMar DeRozan 18 for Toronto. Giannis Antetokounmpo scored a playoff career-high 30 points to lead the Bucks. Rookie guard Malcolm Brogdon added 19 points on 7 of 11 from the field and 5 of 7 from three-point distance. Toronto shot 57.7% from the field (41 of 71) and made 12 of their 27 three-point attempts.